The traditional Balinese compound at Murni’s House is more than a small hotel — you are visiting a loved family home. This is the real deal and not some contrived imagined Bali, making it a wonderful introduction for those interested in the local culture. Graceful and passionate Ibu Murni is an Ubud icon. She is a pioneer of tourism in Bali, having opened one of the first restaurants in Ubud in 1974. She’s an expert in Asian antiques and textiles and has written about Balinese art and culture. At the time of our visit, Ibu Murni was in the compound’s restaurant holding court entertaining guests. Amid beautiful shady gardens, full of flowers and stone carvings, are several guest houses of varying styles. We visited The Room – a charming wooden and bamboo fan-cooled room. Adorned with paintings and sculptures, it feels like a comfortable lived-in home. The Room is not new, but well kept and impeccably clean. Light filters though the trees outside resulting in it being a little dark inside. Wooden slats above the windows are open to the elements, so it’s refreshingly cool and airy. The bed doesn’t have a mosquito net, which may be a concern to some, in such an open space. The clean ensuite bathroom has a hot water shower. A comfy rattan lounge upholstered with a palm-frond design, is the focus of the large balcony living area — a perfect spot to unwind and enjoy the calm tropical surrounds. Coffee, tea and drinking water are provided and breakfast can be served all day. Cultural tours and classes are on offer and the spa within the compound comes highly recommended. If you’re after for all mod-cons, Murni’s House may not be for you — this is old Bali and not everything is perfect. There’s no swimming pool, however WiFi is available. For an authentic experience and an opportunity to encounter true Balinese hospitality, we would recommend Murni’s House. 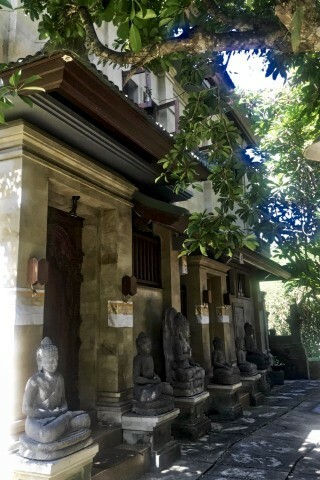 Nearby Honeymoon Guesthouse shares similar classic Balinese styling if you’d prefer a hotel with a pool. Check rates at Murni’s House on Booking.com. Room: Deluxe bungalow, low season: 2,500,000 rupiah, high season 2,500,000 rupiah. Notes: Sleeps five.